Saratoga may now be nationally recognized for its historic thoroughbred racecourse, but its history dates back to the Mohawk Indians, who credited the area’s naturally carbonated mineral springs with healing powers. 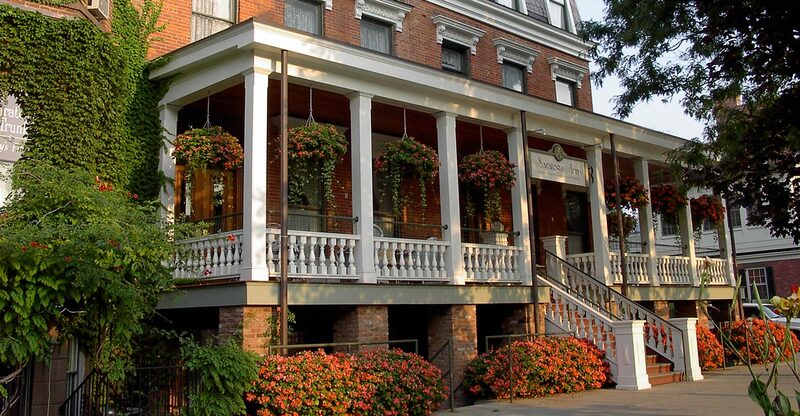 There are currently 17 public mineral springs in various locations around Saratoga Springs, NY. Moreover, the Saratoga Springs area has the only active spouting geysers East of the Mississippi River. You can experience a sampling of these springs on a short, easy walk on the Geyser Creek Trail in Saratoga Spa State Park, a National Historic Landmark, only a mile from the front door of our boutique Saratoga Springs hotel. The mineral waters of Saratoga have long been claimed to cure an array of health maladies, including diabetes, hangovers, cancer, malaria, rheumatoid arthritis, indigestion, and more. 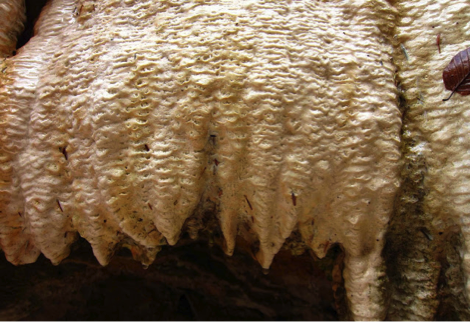 Each spring has a slightly different taste affected by its varied mineral composition, and each spring is rumored to be better at quelling a different illness. 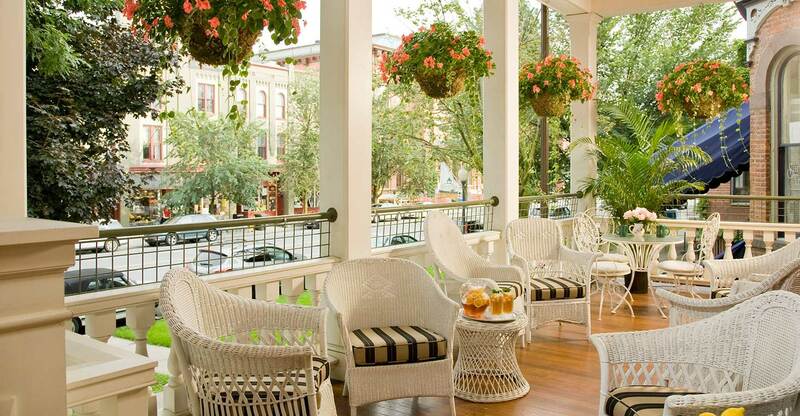 It has become a tradition of many of our hotel guests to take a glass to sample each spring throughout the city. Even if you couldn’t afford the opulence of 19th century Saratoga, anyone could stop by and literally take a taste of the waters. In 1838, John Honeywood Steele wrote in his study of Saratoga spring water that “it is daily sought after and drank by all classes of people.” This spring on the Geyser Creek Trail is rich in iron, as evidenced by the rust that lines its stone basin. 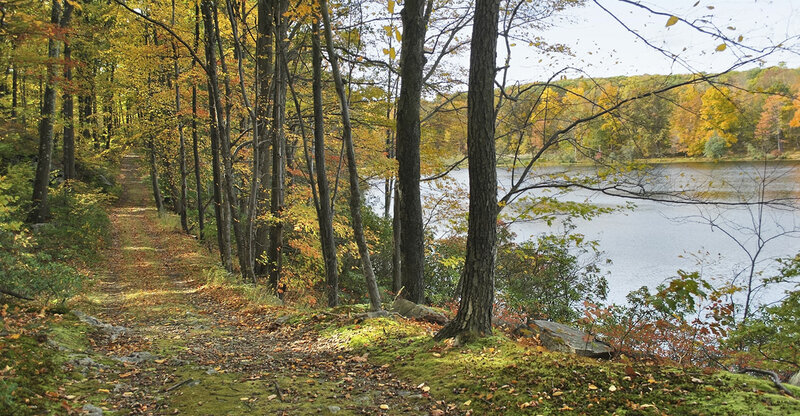 The hike along the Geyser Creek Trail in Saratoga Spa State Park is a short walk of less than an hour. 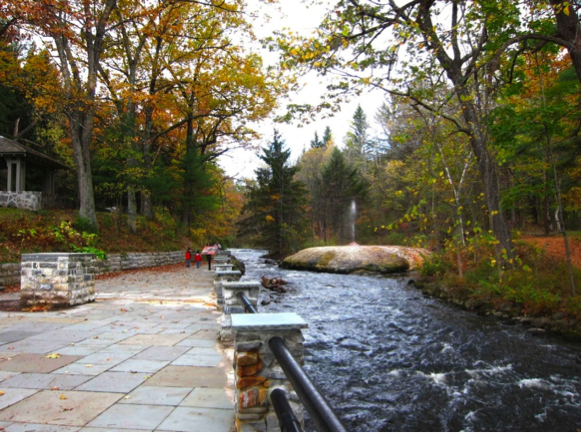 Along the pathway you will see numerous features, including two of Saratoga’s signature springs, Island Spouter and Orenda Spring. There are also numerous mineral deposits, such as this travertine terrace reminiscent of Yellowstone National Park’s Mammoth Hot Springs. The trail follows picturesque Geyser Creek, which converges with the Kayaderosseras Creek approximately a mile away. The Kayaderosseras empties into Saratoga Lake, whose outlet is called Fish Creek. Fish Creek is a tributary of the Hudson River, joining at the town of Schuylerville. The Hudson flows south for hundreds of miles before emptying into the Atlantic Ocean, becoming the mighty river that most are familiar with at New York City. If you are interested in stretching your legs, learning a little history and tasting the different waters that made Saratoga famous, the Geyser Creek Trail is a perfect spot to spend an hour or two. When booking your stay at Saratoga Arms, be sure to check out our in season Pick Your Path Package to make the most of your outdoor hiking adventure!